German Shepherds are lively and alert dogs and are always keen to please their owner. In order to maintain good digestion and long term agility they may benefit from special nutritional care. Eukanuba German Shepherd Chicken has therefore developed this complete and balanced daily food, designed to promote healthy digestion, firm stools and long term agility. Please visit our Breed Facts and Information for the German Shepherd. Recommended For: Adult German Shepherd (1+ years). Also suitable for Belgian Shepherds, who share the same nutritional needs. Vitamin A (45892 IU/Kg), Vitamin D3 (1523 IU/Kg), Vitamin E (255 Mg/Kg), L-Carnitine (48.1 Mg/Kg), β-Carotene (5.0 Mg/Kg). Contain Basic Cobaltous Carbonate Monohydrate (0.60 Mg/Kg), Cupric Sulphate Pentahydrate (56 Mg/Kg), Potassium Iodide (4.1 Mg/Kg), Ferrous Sulphate Monohydrate (752 Mg/Kg), Manganous Sulphate Monohydrate (57 Mg/Kg), Manganous Oxide (40 Mg/Kg), Zinc Oxide (261 Mg/Kg). 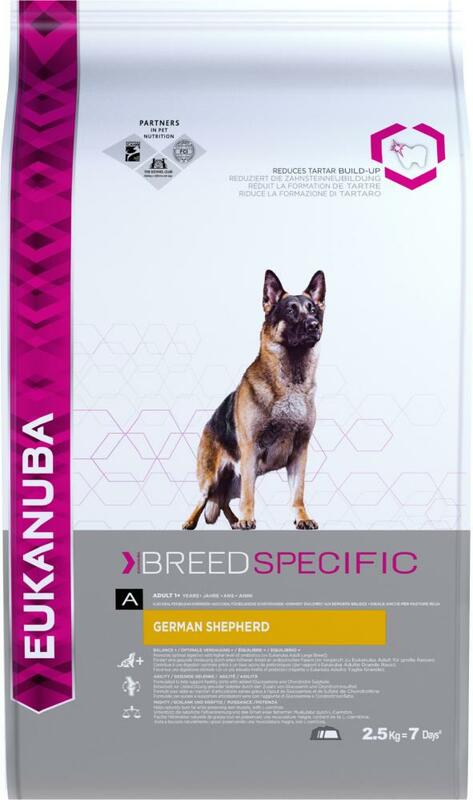 There are currently no questions for Eukanuba Adult German Shepherd Chicken Dog Food - be the first to ask one!